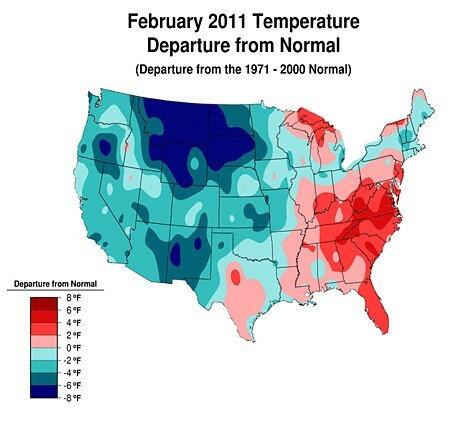 The official February temperature figures are out. And the cooling continues – Sorry this should of course be that the rapid warming continues in an accelerated pace. 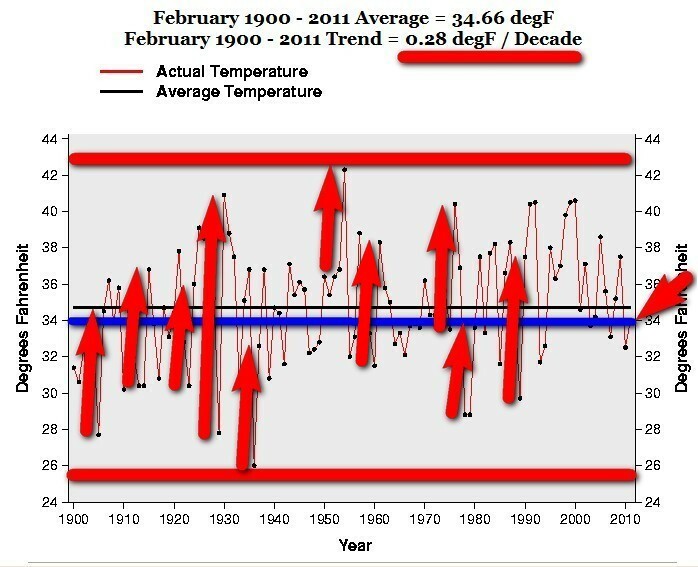 This February is – 0.66 F degrees cooler than the average for 1900-2011. And notice the dramatic rise from 1929 to 1930. A rise of 13.12 F degrees. Well sort of, you had of course the Wall Street crash in late 1929. So now I am only waiting for the Global Warming Hysterics to blame that TOO on “Global Warming” since they have blamed EVERYTHING, and I mean EVERYTHING, on that. From camel deaths to staff shortages in brothels struggle (See for example my post: Orsaken till ALLT elände i världen! ”The cause of ALL misery in the world” and Climate Gate – All the manipulations and lies revealed 201). There are other years in the chart when the temperature increases 6.77 – 7.76 F in one year. And still, somehow mysteriously, USA went on as normal. But an ACTUAL RISE OF 13.2 F degrees IN ONE YEAR is nothing. This entry was posted on 10 mars, 2011 at 12:52 f m and is filed under Fri- och rättigheter, Miljö - Environment, US Temperature, USA, Yttrandefrihet. You can follow any responses to this entry through the RSS 2.0 feed. You can leave a response, or trackback from your own site.